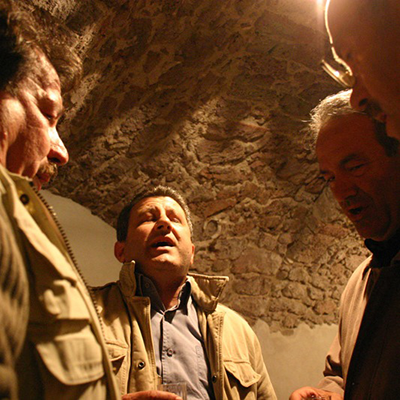 Multipart singing practices are widespread in Sardinia, including different musical structures, mostly in parallel parts and by chording. It is a primary and highly characterized phenomenon that is hard to outline on the whole given the varieties of local music patterns, the social scenarios where these patterns are practiced, the elements of continuity of the past or the recent innovations, the cultural and social meanings the music practices assume and so on. A large amount of field research and studies have been carried out (including some in-depth works on specific local practices), but more still needs to be done. In general, multipart singing by chording has a special relevance. Usually, in everyday language, it is subdivided into two different domains: on the one hand the so-called profane polyphony of the a tenore song repertory and, on the other hand, the religious polyphony of the a cuncordu song, which is linked to the micro-world of the religious confraternity. This subdivision is fictitious and it is confuted by the analysis of several local practices; sacred/profane is not a dichotomy: the practices of multipart singing by chording are present in all contexts of social life, according to the different local customs of each village. From a technical point of view, the different music structures can be represented like a continuum, at one end of which there is a type with a clear distinction between a leading part and three (or four) accompanying parts, while at the other there is the co-presence of more or less equivalent vocal parts. As a rule, each vocal part is performed by one singer. During the performance the singers stand still in a circle. 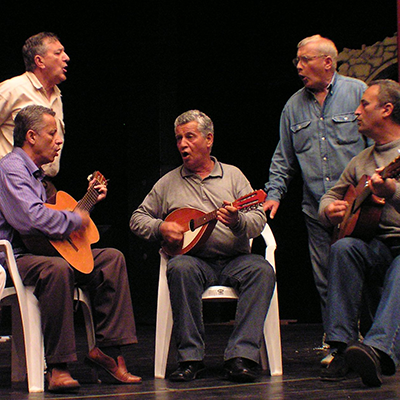 According to Bernard Lortat Jacob (1993), Sardinian multipart singing by chording is a numerus clausus practice, since it is always performed by specialized groups made up only of men. The first type is often performed by four voices/parts. The leading voice is called sa boghe (literally the voice). It begins the performance, giving the tune its tempo, length and tonal shifting. It is also the only voice which sings the text. The other voices are called (beginning with the highest): sa mesa boghe (the “half a voice”, about a third over the boghe), sa contra (“the contra”, about a fourth under the boghe, su bassu (“the bass”, about an octave under the boghe). The designation of the parts may change depending on how they are used in the villages. On the whole, the performance can be described as a soloist song (proposed by the boghe) accompanied by three voices arranged in a chord in root position (1/5/10) singing stereotyped successions of nonsense syllables (bim-bam- birambambo; mba-ué-mba; lallara-lillara; bom-bom-mboro: this feature also varies according to the different villages). This practice is particularly characterized by the special vocal sound techniques of the parts. In particular, the two lowest voices, contra and bassu, show a peculiar guttural timbre created by the distinctive use of the resonance of the oral and nasal cavity. In several villages (for instance in Orgosolo, Bitti, Irgoli, Orune, and Orosei), this structure is called cantu a tenore, while in others there are other names (in Seneghe it is cuntrattu, in Fonni and Bortigali cuncordu, and in Mamoiada it is ussertu ) (Macchiarella-Pilosu 2011). The second type is in four (or sometimes five) voices/parts. The names of the parts and positions are more or less the same as the ones we mentioned before, and vary according to local customs. The performance can be subdivided into macro-units which are clearly delimited by long pauses. Every unit begins with a solo incipit sung by the boghe or the bass. This soloist incipit ends on a precise note where the other parts enter, producing an overlap in the form of a chord, often in 5/8 position, sometimes in root position, which is held or repeated. Then the parts move differently within very narrow ranges creating various overlaps that lead to a point where the part movements stop, producing a chord again which often corresponds to the initial one. Each part has a specific timbre of its own (but there are no guttural voices), and during the performance the four voices search for the highest possible level of merging of the voices which creates the quintina phenomenon, i.e. the emergence of the first overtone (see Lortat Jacob 1998). In some villages (Santulussurgiu, Orosei) this multipart singing typology is called cantu a cuncordu (“in harmony”), while elsewhere there are other designations. In the Gallura area (northern Sardinia), a fifth high voice is added: it is called tripli, and enters in the cadenzas, doubling the fundamental an octave higher (see again Macchiarella-Pilosu 2011). Music patterns in two (and sometimes three) parallel parts are spread all over the island. Usually they are inclusive practices, allowing the broadest level of participation by men and women. These practices are common in devotional contexts, above all in the singing of the gosos (songs in praise of the saints sung in Sardinian) and su rosariu (rosary). In the city of Cagliari during the Holy Week rituals, hundreds of men, women and children establish large choirs performing in parallel parts, reaching an impressive sound volume. A special pattern in two non-parallel parts is linked to the local poetry duels and the cantu a mutetu of the campidanese area in the south around Cagliari. It is a specialized male practice performed by two voices with peculiar vocal timbres (including guttural effects), singing nonsense syllables which accompany elaborate monodic performances by alternate voices. Ovidio Addis. 2003. I canti del Montiferru. Udine: Nota. Arcangeli, Piero and Pietro Sassu. 1988. “Esempi di polivocalità nel repertorio liturgico di tradizione orale in Italia. In Musica e liturgia nella cultura mediterranea.” Piero Arcangeli, ed. Firenze: Olschki. 39-64. Arcangeli, Piero and Pietro Sassu. 1990. “Musica liturgica di tradizione orale.” In Canti e Musiche popolari. A cura di Roberto Leydi. Milano: Electa. 85-94. Arcangeli, Piero and Roberto Leydi, Renato Morelli, Pietro Sassu. 1987. 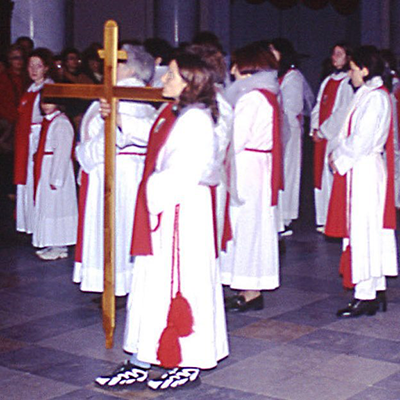 Canti liturgici di tradizione orale. 4 LPs. Milano: Albatros. (second edition 2011. Udine: Nota). Carpitella, Diego and Leonardo Sole, Pietro Sassu. 1973. La musica sarda, I-III (“Documenti originali del folklore europeo”), Booklet to the LPs. Milano: Albatros VPA 8150-52. Corimbi, Martino. 1994. Sardegna: Confraternita delle voci. Orosei. Canti liturgici di tradizione orale. CD. Udine: Nota. Corimbi, Martino and Paolo Mercurio. 2007. Cuncordu de Orosei, Requiem. Decimomannu: Frorias. Deplano, Andrea. 1995. “Il canto a tenore: un diplodoco nell’era informatica.” Quaderni di M / R, 31. Modena. 107-123. Devito, Luca. 2008. Cuncordu e tenore de Orosei. Viterbo: Stampa Alternativa. Fara, Giulio. 2001. Sulla musica popolari in Sardegna. Nuoro: Illisso. Gabriel, Gavino. 1923. Canti di Sardegna. Milano: Italica Ars. Garau, Emanuele and Paolo Bravi, Marco Lutzu. 2003. Tracce di sacro. Percorsi musicali nei canti religiosi della Sardegna. Cagliari: Condaghes. Karlinger, Felix. 1981. Ricerche sul campo in Sardegna trenta anni fa. Brads 11. Lortat-Jacob, Bernard. 1992. Sardaigne. Polyphonies de la Semaine Sainte. CD. Paris: Le Chant du Monde. Lortat-Jacob, Bernard. 1993. “En accord. Polyphonies de Sardaigne: quatre voix qui n'en font qu'une. ” Cahiers de Musique Traditionnelles 6. 69-86. Lortat-Jacob, Bernard. 1998. Chants de Passion. Au coeur d’une confrérie de Sardaigne. Paris: Les editions du Cerf (First edition: Canti di passione. 1996. Lucca: Libreria Musicale Italiana). Lortat-Jacob, Bernard. 1999. “Sardinia.” In Garland Encyclopedia of World Music. Europe, New York-London. 626-633. Lortat-Jacob, Bernard. 2000. “Ditelo con i fiori o con i canti.” In Tutti i lunedì di primavera. Rossana Dalmonte and Ignazio Macchiarella, eds.. Trento: Università degli Studi di Trento. 37-58. Lortat-Jacob, Bernard. 2001. Musiche in festa. Cagliari: Condaghes. (First edition: 1994. Musique en fête. Paris: Société d’ethnologie). Lortat-Jacob, Bernard. 2001. “Sardinia.” In The new Grove Dictionary of Music and Musicians. Macmillian, London. 517-519. Lortat-Jacob, Bernard. 2011. “Singing in company.” In European Voices II. Cultural Listening and Local Discourse in Multipart Singing Traditions in Europe. Ardian Ahmedaja, ed. Vienna: Böhlau. 23-35. Lortat-Jacob, Bernard and Ignazio Macchiarella. 2012. “Musica e religione. Parte I.” In Enciclopedia della Musica Sarda. Volume 6. Francesco Casu and Marco Lutzu. Cagliari: Unione Sarda Editoriale. Lubej, Emil H. 1993. “Genres in the repertoire of the Sardinia Tenores.” Ethnomusicologica II. Atti del VI European Seminar in Ethnomusicology. Giovanni Giuriati, ed. Siena: Accademia musicale Chigiana. 41-59. Lutzu, Marco. 2003. Suoni di un’isola. Vol.1 Tenores. CD audio/rom. Cagliari: Live Studio. Lutzu, Marco. 2009. Sa passione. La riscoperta del canto a cuncordu a Nughedu San Nicolò. Cagliari: Live studio. Lutzu, Marco. 2007. “Canto a tenore: il trattamento del testo in su ballu sèriu di Bitti.” Musica Domani. Trimestrale di Cultura e Pedagogia Musicale – Organo della Società Italiana per l’Educazione Musicale, Anno XXXVII, N. 144. Torino: EDT. 30-31. Lutzu, Marco. 2010. Ambiguità metrico-ritmica nei balli della Sardegna centro-settentrionale. Analitica, Rivista Online di Studi Musicali. n. 4: www.gatm.it/analitica/numeri/volume4/numerounico/2.htm. Lutzu, Marco. 2012. “Rediscovering multipart tradition: the case of Nughedu San Nicolò (Sardinia).” In Multipart music: a specific mode of musical thinking, expressive behaviour and sound. Ignazio Macchiarella, ed.. Udine: Nota. 415-426. Macchiarella, Ignazio. 1995. Il falsobordone fra tradizione orale e tradizione scritta. Lucca: Libreria Musicale Italiana. Macchiarella, Ignazio. 2008. 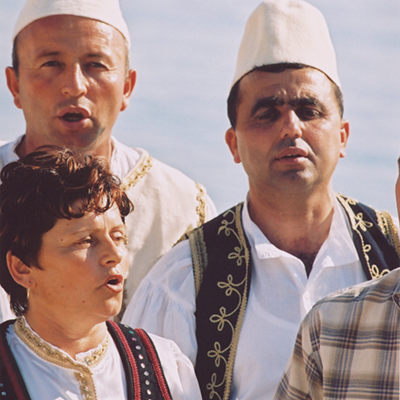 “Harmonizing in the Islands: Overview of the multipart singing by chording in Sardinia, Corsica, and Sicily.” In European voices I. Multipart singing in the Balkans and in the Mediterranean. Ahmedaja, Ardian and Gerlinde Haid, eds. Vienna: Böhlau. 103-158. Macchiarella, Ignazio. 2009. “Il canto a tenore e la costruzione di identità locali: una ricerca ad Oliena (Nuoro).” Antropologia della musica nelle culture mediterranee. Interpretazione, performance, identità / Musical Anthropology in Mediterranean Cultures. Interpretation, Performance, Identity. Philip V. Bohlman and Marcello Sorce Keller, eds.. Bologna: Clueb. 37-47. Macchiarella, Ignazio. 2012a. “Current Creativities in Multipart Singing Practice.” Trans.Transcultural Music Review, n. 16. 1-20. Macchiarella, Ignazio. 2012b. “Note sullo Stabat Mater nelle pratiche dell’oralità musicale in Sardegna.” Rivista Internazionale di Musica Sacra, n. 33. 445-458. Macchiarella, Ignazio 2013. “L'attualità della pratica del falsobordone.” In Atti del Congresso Internazionale di Musica Sacra. Antonio Addamiano and Francesco Luisi, eds.. Città del Vaticano: Libreria Editrice Vaticana. 341-352. Macchiarella, Ignazio. 2014a. “Exploring micro-worlds of music meanings.” El oìdo pensante, anno 2, n. 1. 1-16. Macchiarella, Ignazio. 2014b. “Su trazzu e su Te Deum : créativité musicale contemporaine dans un village sarde. ” In Les Corpus de l’oralité Sous la direction de Mondher Ayari. Antonio Lai, Delatour. Paris : Collection Culture et Cognition musicales. 155-165. Macchiarella, Ignazio and Giampaolo Mele, eds.. 2008. Hymnos. Una rete per lo studio del canto a più voci fra oralità e scrittura. Udine: Nota. Macchiarella, Ignazio and Roberto Milleddu, Luigi Oliva. 2012. Cori polifonici. Parte I e II. In Enciclopedia della Musica Sarda. Volumes 15 and 16,Francesco Casu e Marco Lutzu, a cura di, Cagliari: Unione Sarda Editoriale. Macchiarella, Ignazio and Sebastiano Pilosu. 2011a. 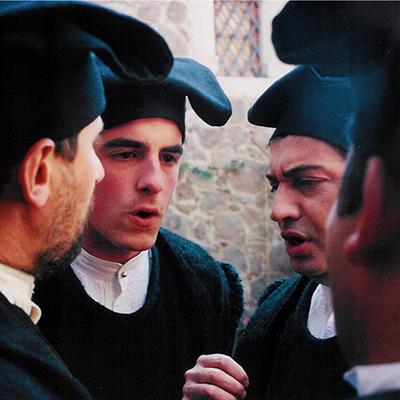 “Technical terms in Sardinian multipart singing by chording.” In European Voices II. Cultural Listening and Local Discourse in Multipart Singing Traditions in Europe. Ardian Ahmedaja, ed.. Vienna: Böhlau. 143-153. Macchiarella, Ignazio and Sebastiano Pilosu. 2011b. “Lexicon of local terminology in multipart singing in Sardinia.” In European Voices II. Cultural Listening and Local Discourse in Multipart Singing Traditions in Europe. Ardian Ahmedaja, ed.. Vienna: Böhlau. 381-389. Macchiarella, Ignazio and Sebastiano Pilusu. 2015. Bortigali: un paese e le sue musiche. (CD included) Udine: Nota. Marras, Marcello. 2003. Un paese in piazza. Carnevale a Seneghe. Cagliari: Condaghes. Mele, Giampaolo. 2004. “Il canto dei Gosos tra penisola iberica e Sardegna. Medio Evo, epica moderna.” In I gosos: fattore unificante nelle tradizioni culturali e cultuali della Sardegna. Roberto Caria, ed.. Oristano: Provincia di Oristano. Mele, Giampaolo and Pietro Sassu, eds. 1993. Liturgia e paraliturgia nella tradizione orale. Cagliari: Universitas. Mercurio, Paolo. 1991. Folklore sardo. Orosei: storia, lingua, canto, poesia. Milano: Ghedini. Milleddu, Roberto. 2012a. “Cal’est su giustu” (what’s the right thing?). Notes on multipart singing in Bosa.” In Multipart music: a specific mode of musical thinking, expressive behaviour and sound, Ignazio Macchiarella, ed. Udine: Nota. 427-438. Milleddu, Roberto. 2012b. Musica e religion. Parte seconda. In Enciclopedia della Musica Sarda, Volume 7. Francesco Casu and Marco Lutzu, eds. Cagliari: Unione Sarda Editoriale. Milleddu, Roberto. 2013. “Il canto dell’assenza. Lo Stabat Mater nel contesto rituale della Settimana Santa a Bosa.” Rivista Internazionale di Musica Sacra n. 33, 2012/1-2. 459-474. Muszkalska, Bozena. 1995. Traditionelle mehrstimmige Gesänge der Sarden. (audio tape included) Poznan: Wydawnictwo Poznanskiego Towarzystwa Przyjaciol Nauk..
Quaquero, Myriam and Antonio Ligios. 2006. Musiche e musicisti in Sardegna. Cappelle teatri e istituzioni tra Sette e Ottocento. Sassari: Delfino. Pilosu Sebastiano. 2012. “Canto a tenore and “visibility”. Comparing two communities, Orgosolo and Bortigali.” In Multipart music: a specific mode of musical thinking, expressive behaviour and sound. Ignazio Macchiarella, eds. Udine: Nota. 427-441. Pilosu, Sebastiano. 2012. Il canto a tenore. Parte I e II. In Enciclopedia della Musica Sarda, Volumi 1 e 2. Francesco Casu and Marco Lutzu, eds. Cagliari: Unione Sarda Editoriale. Pilosu, Sebastiano. 2015. “A cuncordu.” In Bortigali: un paese e le sue musiche. Ignazio Macchiarella and Sebastiano Pilusu. Udine: Nota. 72-94. Salis, Francesco and Pietro Sassu. 1995. Sardegna. 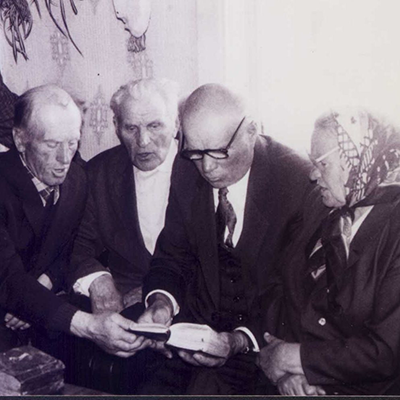 Confraternita delle voci – Santulussurgiu. CD. Udine: Nota. Sassu, Pietro. 1981. “La settimana santa a Castelsardo.” In Atti del vi convegno di studio ‘Rappresentazioni arcaiche delle tradizione popolare’, s.e., Viterbo. 83-90. Sassu, Pietro. 1982. “La musica di tradizione orale.” In La Sardegna. Volume 1. Mario Brigaglia, ed. Cagliari: Edizioni della Torre. Sassu, Pietro. 1987. “Sardegna.” In Arcangeli, Piero and Roberto Leydi, Renato Morelli, Pietro Sassu. Eds. Canti liturgici di tradizione orale, 4 LPs. Milano: Albatros. 18-24. (second edition 2011. Udine: Nota). Sassu, Pietro. 1998. Canti popolari di Bosa e Planargia. CD. Udine: Nota. Sassu, Pietro and Renato Morelli. 1993. Sardegna. Confraternita delle voci – Castelsardo. CD., Udine: Nota. Sassu, Pietro and Renato Morelli. 1995. Sardegna. Confraternita delle voci – Cuglieri. CD. Udine: Nota. Solinas, Chiara. 2007. Una ricerca antropologico musicale in ambito urbano. I canti e i riti della Settimana Santa a Cagliari. Portales n.9. 135-141. Soro, Marco, ed. 2008. Bogi longhi. I canti e la storia di un coro di Castelsardo. Cagliari: Livestudio.